In 1971, Gordon Gow wrote a 20 page advertising brochure that described the new ML loudspeakers. 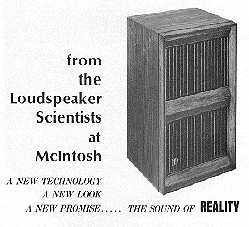 The front page had a picture of the ML-1C and was titled "McIntosh--From the Loudspeaker Scientists at McIntosh--A New Technology, A New Look, A New Promise---the Sound of REALITY." Rather than just copy the text from it, I felt it would be more interesting to see his words on the same subject as they were spoken at one of the many seminars given at various dealers. Not only was there information about the speakers, but also there were additional remarks and related topics that weren't in the brochure. This includes record care, cartridges, damping factor, unusual customer situations, company history and company policy. After Gordon had given a lecture like this and had returned to the lab, he would say to me "I hope I haven't uttered too much heresy about the speakers" and we both would laugh. Here is a partial transcript from the seminar at Audiocraft Co, Cleveland, Ohio on September 25, 1971. "Good evening. My name is Gordon Gow. I'm Vice President of McIntosh laboratory. I thought maybe before we got busy with the loudspeaker story you might like to know a little bit about us, the size company we are and so on. Actually, we started off as a corporation in 1949 with a very, very modest start, total capitalization of $18,000. The business started when Mr. Mac and I jointly collaborated on the invention of a unity coupled output circuit for power amplifiers and that was the basis for practically all the products we manufactured from 1949 until just last year (1970). In fact, we still have 2 or 3 years to run out on one of the divisions of our original patent case. The business has since grown to a point that where this year we'll do about 9 million dollars in volume. The company now has a net worth of about $2,000,000 and employs some 300 people. 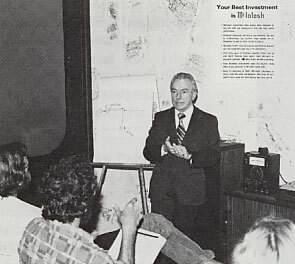 To give you an idea of some of the management mistakes we've made when we first went into business in 1949, we thought we'd naturally develop not only electronic amplifiers and preamps, but loudspeakers as well. We just recently completed the development of a set of loudspeakers and this took a total investment of a little over a 1/4 million dollars just to get to the point where we could go into manufacturing. It took about $130,000 worth of test equipment and the rest of it was salaries over a 5 year period of time. Looking at it in retrospect, we were a little brash trying to get that job done with a company that had a net worth of $18,000 to start with. However, back in 1950, we hired a man named Rudy Bozak as a consultant for us, and tried to break into loudspeakers in a big way. We had Rudy develop a 2-foot by 2-foot square loudspeaker and it turned out to be an absolute engineering disaster. The cone material could not be made stiff enough so it flexed out of shape at a frequency as low as 80 cycles. The frame that supported the speaker motor, the voice coil, and magnet assembly couldn't be made rigid enough so that when the cone went to move forward, the whole motor assembly moved backwards as far as the cone moved forward. Of course you don't get any music out of the motor assembly moving. So we abandoned that project and we hired another fellow named Art Janzen to investigate electrostatic loudspeakers and kept him on the payroll, I guess, for about 6 years. We finally came to the conclusion, and I think this time perhaps right conclusion, that the electrostatic loudspeaker business was just fraught with too many difficulties at that time. There weren't the right kind of plastics around that had their correct characteristics to really get the job done. Incidentally, there are some new plastic materials coming on the market that make it possible that an electrostatic loudspeaker could be developed now. What happens there is that you get involved with insulating the parts of the electrostatic speaker so that they don't spark over. When you use a plastic that has enough dielectric strength to stand the applied voltage, then the volume resistivity is so high that all of the flux (field) is concentrated in the insulation instead of in the space where you need it. Finally, some new plastic developments are occurring that make that system look a lot more attractive. But, for the time being, it seems that the permanent magnet loudspeaker is still holding sway. What we did to start this project going about 5 years ago where the company had gotten to a position of strength where we could afford to have a couple of engineers on the payroll who weren't producing any income (that was Roger Russell and his assistant, Bob Campbell) was to buy them a bunch of test equipment and let them go to work on what they thought was the right way to do the job. What we did then was to buy one of everything that was on the market, investigate it, analyze it, measure it, and listen to it and see if we could develop a correlation between what we measured and what we heard. It turned out there were two areas where conventional loudspeakers seemed to be somewhat deficient. Most of them that we measured had highly directional radiation patterns. In addition to that, they had substantial levels of intermodulation distortion. Now those two things we found were somewhat undesirable, especially in a stereo system. You can't really complain in a sense too much about the engineering that produced these things because they were nearly all produced as monaural (monophonic) loudspeakers years ago and simply adapted to stereo systems. If you're always sitting on the axis of the loudspeaker, the fact that it became directional really didn't bother a whole lot. But, when you start to listen to two loudspeakers, and their directional properties start varying with pitch from this kind of a thing to this kind of a thing (shows diagram), it means that if you were sitting over here, as pitch went up, that particular sound could disappear entirely from one channel. Or, if you were sitting at this point, this sound-this particular pitch could sound too loud. Another way of looking at this is that the frequency response characteristic of the loudspeakers off axis suffers a violent set of excursions. This we found to be highly undesirable when you are trying to focus your attention on the location of instruments across the room between the two loudspeakers. What you really want to design for is a highly dispersed radiation pattern that remains that way over the entire pitch range. What we achieved was just that effect and it means that you can stand here in front of this loudspeaker and hear the other one in the corner through it's whole pitch range. I'll be able to demonstrate that for you later on tonight. That means you can literally sit just about anywhere in the room and have a complete stereo perspective. It's something that literally can't be done with any other system that I know of that's on the market today. 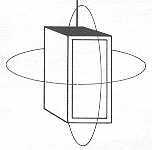 The way that you design a system to achieve this widely dispersed radiation pattern is to recognize the full impact of what is called the aperture effect in the physical laws that control radiation. Whether you're talking about light radiation, electromagnetic radiation or sound radiation it doesn't really make any difference. The physical realities still apply. It turns out that if you are radiating a wavelength, that is much larger, much longer, than the dimensions of the radiator, then the radiator operates on a non-directional widely dispersed basis. (pictures are displayed) These radiation patterns were taken from Dr. Beranek's book on acoustics and what they show is the change in directional pattern as pitch increases for a 12" diameter radiator. At 350 cycles where a wavelength is three feet, the system is down only about 7 decibels on either side of it. Then as pitch increases it drops down to 10, then finally to 23 for one more octave and finally goes into a series of major and minor lobes. If you could restrict the radiation so the maximum frequency you're radiating had a wavelength that was long in relationship to the radiator, you could really operate on a non-directional basis. This is where we get into a real serious problem. As marvelous as the human eye is, we see over a dimensional range of less than 2:1. Red light, for example, is approximately 7/10ths of a micron in length. Blue light is 4/10ths of a micron, a micron being approximately 40 millionths of an inch. On the other hand, a wavelength of sound at 20 cycles is 55 feet long, about, I guess the length of the diagonal from that corner to the upper corner there. At 20,000 cycles, a wavelength is only 6 tenths of an inch. So we literally hear over a dimensional range of 1000:1. This really presents some serious problems because if you try to radiate too wide a bandwidth from a 12" radiator, by the time you got to 1000 cycles, you would have a wavelength that was beginning to impose a highly directional pattern on the 12" diameter loudspeaker. So this says that you have to break the sound spectrum, the ten octaves of sound, up into 4 or 5 segments so that you can handle them correctly. What we actually do with these little bookshelf loudspeakers, for example, is to start off with a 12" diameter loudspeaker and right away that gets you into a semantic problem. You find out that the loudspeaker manufacturers lie a little bit just like the guys who make cereal boxes. They don't fill the box all full of cereal and they don't fill the loudspeaker all full of active radiator. It turns out that a 12" diameter loudspeaker is simply a direction that tells a man to cut a hole 12" in diameter in order to mount the loudspeaker. What you really get is about 10" of active cone. The 10" of active cone start radiating at 20 cycles and radiate to 250 cycles, where a wavelength is about 4 feet. 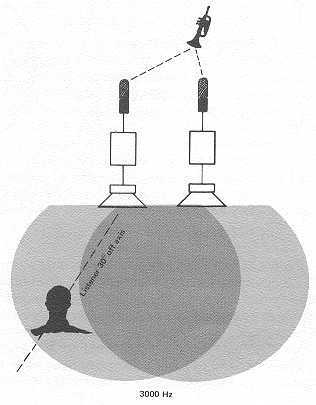 Then that loudspeaker starts to roll off out of the picture both acoustically and electrically and we then start radiating from an 8" loudspeaker, which only has a 5" diameter cone and that radiates from 4 feet, 250 cycles to 1500 cycles where a wavelength is only about 8". The radiation pattern then becomes approximately what you see over here. At that point we move out of the 8" speaker into an inch and a half diameter dome radiator. The dome shape gives the radiator a particularly strong structure for a very light mass. That radiator starts at 1500 cycles, 8" wavelength, and radiates to 7000 cycles where the wavelength is about 1-3/4". Then we go out of that into a compound coaxial radiator. The outside ring or annulus can radiate from 7000 cycles to 14 kilocycles and the inner ring, which is a 1/2 inch diameter button, can continue to radiate to 20,000 cycles where a wavelength is about 6/10ths of an inch. We've used five frequency divisions to keep the radiation pattern widely dispersed. This is why you can walk in front of the speakers and you don't hear any beam of energy at high frequencies. This is why you can stand over here and hear that other loudspeaker through it's whole pitch range and this is why you can literally sit anywhere in the room here and have a complete stereo perspective. Now, it turns out that when you accept this design limitation, and you design a system to have this widely dispersed sound, you also pick up another advantage. When you radiate too wide a bandwidth from one single cone, as pitch goes up, as frequency increases, the acceleration that is demanded of the cone increases until the cone can no longer move as a perfect piston or a uniform surface. (refers to charts) What happens is that it actually bends. Part of it will move forward and part of it will actually bend backwards. 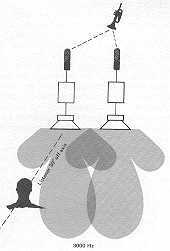 This phenomenon is called cone breakup and these are cone breakup patterns obtained by shining a stroboscopic light on the cone. A light that's flashing on and off in synchronism with the motion of the cone so that it's motion can be visually stopped and you can see what's happening. Where the plus signs occur the cone is flexing outwards. Where the minus signs occur it's flexing inwards. This kind of a pattern is called a radial cone breakup pattern. Then you can have another kind of breakup where the whole center of the cone bulges out and the edge goes in, and you can have a combination of both of these things at one time. To avoid that excessive acceleration, you want to limit the highest frequency to the point where you don't exceed the structural strength of the cone. Now, the thing that is undesirable about the cone breaking up has to do with a basic physical reality for any information processing system and that's really what a hi fi sound system is. Let me pick an analogous situation from the field of optics. If there were a perfectly flat plate glass mirror there on the wall, I could walk up to it and see an exact image of myself in that mirror. But if the mirror were curved, I wouldn't see this perfect image any more. The image would be distorted and the likelihood is it may even be unflattering. 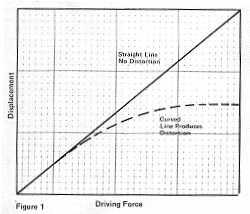 Now, to state that law generally, whenever the resulting motion does not have a linear relationship with the driving force, a system produces distortion. Jjust like in the optical thing when there isn't a linear relationship between the image and the object, then the image is a distorted view of the object. So what you want to have happen here in this loudspeaker is for the entire cone to move forward and to move on a strictly linear relationship with the driving force that is causing it to move. When the cone flexes and breaks up this way it no longer has that linear relationship so it produces distortion. That means that the sound you hear no longer has a 1 to 1 correspondence with the original live sound. (shows a new chart) A way of measuring the actual quantity of distortion is to put in a low frequency signal and a high frequency signal simultaneously and then look at, analyze the signals that come off of the cone. Typically in conventional systems you put in 50 and 3000 cycles and you'll get out 50 cycles and 3000 but in addition, you'll get out 3050, 2950 and 2900 cycles (from the measurement shown on the chart). When you go to 50 and 5000 you'll increase the population of discordant sidebands and increase their amplitude. When you do this in a system, you destroy the definition with which you hear musical instruments. Reeds begin to sound like strings and vice versa and both reeds and strings modify their sound with the presence or absence of rhythm instruments. This, of course, is a highly undesirable condition. Incidentally, if you had a system that had 100% intermodulation distortion, it would reduce the order in music to a complete chaos. That is the ultimate, the mathematical definition of noise is it's a complete random series of events, random in time and random in frequency. That's what would happen if you completely distorted a musical signal. In the systems you're going to hear, at 100 decibels sound pressure level, which is the loudness of a 100 piece orchestra at approximately fifteen feet in front of it, the measured intermodulation distortion is less than 3/10ths of a percent. We don't actually know if it has to be that low. We don't also know if it should be still lower than this. There are some special cases where people have been able to hear intermodulation distortion in music all the way down to small fractions of a 1/100th of a percent. One such case that comes to mind several years ago there was a man in Milwaukee whose name was Ewing Nunn, who incidentally was I believe the son of the founder of Nunn-Busch Shoes. Ewing had a hobby of putting out records under the label Audiophile. These were monaural (monophonic) records on a red vinyl disc run at 78 rpm. This guy was a real fussy guy. The first 60 watt amplifiers we put out had measured intermodulation distortion and measured harmonic distortion on the order of only 3/10ths of a percent but he was positive he could hear something that didn't sound right. We took the things back and analyzed them further and found that the power supply frequency of 120 cycles was intermodulating with the signal to a level of approximately 1/10th of a percent. He could hear that and he could hear it until we improved the system to where that was down to a fraction of 1/100th of a percent. There I think is a special case where that 120 cycle signal was putting a buzz on the violins and Ewing could hear that. It really makes you a little bit frightened to say that 1/10th of a percent intermodulation distortion is absolutely the upper limit and at the same time you have to be cautious not to try to build a system so good that you literally price yourself right out of the market. So what our company actually does is to pay a lot of attention to its customers and see how they are reacting to the products we put out. For example: In the amplifier field we have two fellows (Dave O'Brien and his assistant) on the road continuously they are, no life for a married man believe me--both of them are bachelors. They're away from home from Binghamton 48 weeks out of the year. One of them has just completed ten years of this kind of existence. They'd be two days in one town, like Monday and Tuesday, pack up , fly to another town and do another clinic Thursday and Friday, pack up on Saturday, and on Sunday move to another city. It's absolutely a vicious life but each of those guys will measure in the course of a day approximately 100 amplifiers. They measure amplifiers of every make and model. About 30% of what they measure is McIntosh. In the case of our equipment after they measure it, if it fails to meet it's original specifications then we modify the equipment and bring it right up to date to it's original specifications at no charge to our customers. We have a continuous protection plan going every year for any customer of ours who buys an amplifier or preamp. In addition to this, of course, people are constantly telling these two young men what they think equipment should be built to do. As we make an improvement they tell us they think it's an improvement. If it isn't an improvement, they ask why did we make a change. With that continuous flow of information, and it's a daily flow of information, we are guided in our choice of components, choice of circuit values by our customer's requirements. Perhaps one of the really formidable examples of democracy at work. It's rather a pity that governments can't quite be as democratic in their function. Well, the next advantage to designing with this particular goal in mind is to now consider how to get almost perfect transient response from the low frequency radiators in a speaker system. The way that you measure transient response or the response of the system to percussive sounds is to take a sine wave. Start it as it crosses the zero axis, build it up to it's amplitude, run it for say 10 cycles and then when it hits the zero axis, shut it off again. You can do this electrically and then apply that signal to the loudspeaker terminals. Then you put a very wide bandwidth microphone in front of the loudspeaker and measure the acoustical output and make a direct comparison with how many cycles it took to get it started and how many it went through when it stopped. Now the idea of course is to have this thing approach perfection. No one has actually achieved perfection yet. (shows tone burst pictures) If you notice here if you look at this closely, about the first half of the first cycle is missing. It takes that long to actually overcome the inertia of the cone and make it move and then similarly the cone continues to move for a half a cycle. Typically, conventional systems will continue to move for anything from 5 to 50 cycles. Now the way that you stop the cone from moving, is much the same kind of engineering that is applied to the suspension of a car. If you've ever had the experience of driving a car that had defective shock absorbers, every time you hit a bump the thing just continues to wiggle like that for some period of time. What you do is add a mechanical resistance, the shock absorber, across the spring so that when you hit a bump, there's an attenuated input to the body but it doesn't continue to vibrate. That energy is absorbed by the shock absorber. What it really is, it's a mechanical resistance that absorbs that surplus energy. Now you have to apply the same thing to the loudspeaker. The way you do it in a loudspeaker is in a sense a little curious. The bigger the magnet that you put on it, the more it stops the motion of the cone. The price you pay is the bigger the magnet you put on the loudspeaker, the more you roll off the bass. That's the part that people have a hard time understanding. The bigger the magnet that you put on a loudspeaker, the less is the bass output. Another way, however, of stating that so that is a little bit more understandable is that the bass output remains constant as you add more magnet but the output at mid frequencies rises very rapidly. The speaker has an apparent loss in bass output but what was really happening is the mid frequencies were gaining in output. Designers have stayed away from an overdamped loudspeaker because this is the kind of response curve you got and people just wouldn't buy that kind of loudspeaker. So what they did was put smaller and smaller magnets and lighter (heavier) cones, which gave you a flat frequency response but then had exactly the analogous problem of an inadequate shock absorber on a large car. The loudspeaker continued to vibrate after it should have stopped. With the advent of solid state power amplifiers that have enormous power handling capacity, we realize that there was the possibility of having your cake and eating it too. That is use an overdamped speaker construction to get this perfect transient response but plug into it an electrically compensated signal that had a curvature exactly the complement of this curvature. 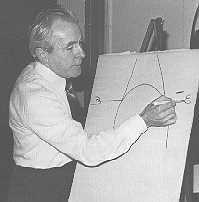 (shows chart) The sum of this curve and this curve give you a flat response. This increases the cost of the system, of course. The smallest equalizer we make to handle that job is actually $74.50, I believe. We felt that it was really worth while to achieve the kind of transient response that you will hear in a little while. It does also afford another advantage, however. 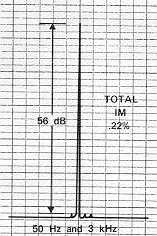 That is, the actual bass output of a loudspeaker is variable and depends on where you place the loudspeaker in the room. Now that bothers a lot of people. They don't understand why the speaker has to be fussy about where it's placed. Why can't it just sit there and do its job and not worry about the room. To get an idea of what's happening here, you have to imagine, say a 12" diameter loud speaker mounted in a little box and suspended on a wire between the floor and the ceiling between the walls and it's radiating a signal at 20 cycles, a wavelength of 55 feet. When it's radiating a way down at that frequency, that pressure wave flows out of the speaker all the way around to the back and you actually measure as much power at the back as you do in the front, on either side, above it and below it. So the speaker is radiating into a sphere and it will continue to radiate into a sphere as frequency increases until wavelength drops down to the point where the pressure wave no longer flows all the way around to the back of the speaker. Now, you lower the speaker from this point that it's suspended to the floor and what happens is the floor acts as a perfect reflector and reflects half of that wave back. Sound waves, unlike water waves, are a longitudinal vibration. Water waves are a transverse vibration. 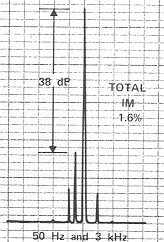 One of the properties of a longitudinal vibration is that the reflected signal comes back in phase with the incident signal and reinforces it. In this case that reflected signal looks like you had twice the energy supplied to the loudspeaker. You are hearing a 3 decibel increase or a doubling of power because what you did was take the sphere and cut it down to a hemisphere. You focused the energy from a sphere into a hemisphere. You slide the speaker across the floor to a wall that acts as a perfect mirror and you slice the hemisphere in half and make it a quarter sphere. Then push it that way into a corner and you cut it down again into an 1/8th sphere and pick up another 3 decibel increase. So the power output can go up 8 times and the way of expressing a power ratio of 8 to 1 is to say that it's gone up 9 decibels. 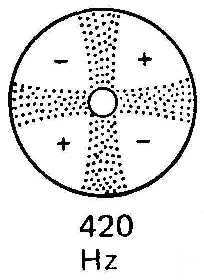 Now you'll notice this effect only occurs really significantly for frequencies below 100 cycles. If you were designing a system that only went to 100 cycles, you don't have to worry about it. When you design a system to go down to 20 cycles, then this is a matter of some concern because you don't want to have the program content overbalanced at the low frequency end. Another problem is that in many houses there's only one corner available to put a loudspeaker. The other loudspeaker may have to be free standing or standing against a wall. By putting a left-right correction on the equalizer, you can control the total acoustical output so that one loudspeaker can be matched against the other. If you go all the way, you'll produce a flat response. If you just use this curve, you can attenuate the low frequency response. You can offset the room gain that occurs when you put a loudspeaker in a corner with this equalizer or you can augment the absence of room gain if the loudspeaker has to be free standing in a room. Well, this gives you a rough idea of all the factors that we took into consideration that you could classify I guess as the electrical factors. The next thing that had to be considered were the structural requirements for a system of this sort. Musical instruments, which are used to produce music, all require some resonant characteristic but loudspeakers that reproduce music need to have a complete absence of resonances. (hits cabinet) When you hit a cabinet with a low tone, you don't want that cabinet to act as a musical instrument. You want it to be completely free of resonance. You don't want to hear any boom out of that box. Now the way that you achieve that goal is you construct a cabinet of particleboard. These are particles of wood bonded together with a plastic adhesive and manufactured in various thicknesses. What we use here is 3/4" particle board with a density of 60 (45) pounds per cubic foot so that it's heavy and free of resonances. The top of the cabinet has a hardwood reinforcing rib running across the entire top, 2 inches wide, 5 inches thick, down either side, across the bottom and then each cabinet is reinforced front to back. The cabinet pieces are all glued across their entire length and screwed together. In the case of this cabinet, there's a septum 3/4-inch piece of particleboard that divides the cabinet into two cavities. That's glued and screwed both sides and front to back to give this thing a very rigid construction. The unfortunate consequence of doing all this is that cabinet gets to weigh 265 (212) pounds. That's just about the elastic limit for hi-fi sales people to lift that up and carry it up a set of stairs to a second floor. You see, this leads us to an interesting point and that is every design that you look at is some kind of a series of compromises made against a series of constraints. You can't just build something to your idea of perfection or the cost of the thing can get completely out of range, or the weight can get out of range, or the size can get out of range. You have to literally determine what is the optimum set of values, what is the amount of excellence or the degree of accuracy you can put in for a given selling price, for a given size, weight and so on. For example: It's possible that we could make the sound of this cabinet a little better if it was a higher cabinet but the research that we did said that the average housewife would simply not tolerate it. It looks like the maximum height you can really employ is something like 29 or 30 inches. You could do a slightly better job by building a still heavier cabinet but our dealers told us if you go over 300 pounds, forget it. Don't even bring it around the store. You could possibly build a better system if you put another thousand dollars of cost in it, but again you have to live with some practical considerations. Now that means that no matter what you do, what product you put out, there's always going to be something you can do to make it better. There's some way, some new material, some new engineering application, some new way will be found to improve the thing. Many people have the impression that we do this deliberately that this is some kind of planned obsolescence but they just aren't understanding accepting the realities of the market place. If we don't make an improvement in our products, competitors will and all of a sudden we're out of work. The minute that we put a product out, we embark on an immediate program of how to improve it. Somehow or other give it the same performance for less money. Give it better performance for the same money. Find some way of doing it because you can be sure if we aren't working at it , all of our competitors are. I thought it might be worth while for you to see in perspective why there is an evolutionary aspect to all the equipment, especially of any value in the market. I recall in World War II I happened to be in the air force. I was attached to the Royal Air Force in England for some time. These people took great pride in the fact that their designs were some kind of an ultimate answer, that that was as far as you really needed to go and it's significant today that they have really practically lost their aircraft industry. They have lost a major portion of their electronics industry, even of the boat building industry. I don't think that it's possible today to really resist the necessity to constantly update things, especially when you look at the competitive impact of the rest of the world. I've had the pleasure of visiting with a number of Japanese business people over here and I can tell you these people are resourceful, intelligent, hard working, dedicated people who will work if necessary around the clock. When you think of the way the world is shrinking, in terms of time, with the advent of faster and faster airplanes, and you realize we are only what, 6 percent of the population of the world. There is no way that we can sit still, just absolutely no way or we'll shrink back to so small a nation, back to some kind of agricultural society. The only way that I can see that this country or any country for that matter can really maintain it's position is to adopt this attitude right across the board. What distresses me is that when I hear people decide this is merely some kind of business community trick, you know, to keep products selling. They're just not accepting the realities. Again, This particular piece of music has that same kind of repetitive structure that makes it kind of nice to hear the difference between these speaker systems. Incidentally the thing that I'm using here to clean the records is a device called a Parastat. I had an interesting experience with this last year. I was taking these loudspeakers around to show to our dealers over about a 7 week period of time )(damn near got myself divorced while doing it) The wife really doesn't like being away for that long a time. I was using several records over and over and demonstrating, you know, 7, 8, 9 times a day and one record in particular we got up to 170 plays from it. It was a Boston Pops Carmen music. When I got through with the trip and brought it back home, we measured the background noise level and it had only risen 2 decibels over a first play pressing. I really got convinced of the necessity to keep these records clean. This particular device does a very good job of it. They supply it with a little gadget called a humid mop. After you collect dust on this instead of brushing it off with your hand and getting any oils from your skin into this thing and then transferring that into the grooves of the record you can keep the thing clean this way and keep this kind of gunk from slopping up both the grooves and I think most importantly in all probability the stylus. One of the things I think escapes people is the extremely small size of the stylus that is used to pick up the groove modulation. That thing is only 7/10ths of a mil, 7/10ths of 1/1000ths of an inch wide, and it's seated transverse across the grooves and 2/10ths of an inch thick and shaped in an ellipse. The thing that's interesting here is that the stylus is subjected to accelerations on the order of 1000 g's, which is simply a phenomenal accelerating load. In order to keep the force of the stylus exerted against the groove walls; to keep that from exceeding the elastic flow limit for the, plastic the tip mass has to be reduced to 1/10th of a milligram so that when it's accelerated to 1000 g's the equivalent mass is only at 1/10th of a gram. You have such a small amount of area resting on the groove the total force is measured in tons per square inch. It doesn't take much imagination now realizing how small that thing has to be and how accurately it has to be shaped to see that a very small accumulation of oil and dust, which will make a kind of a gummy substance, will either alter the shape of the stylus or if you get enough of it where the stylus is attached to the armature, it will literally lift it a little bit out of the groove and it loses contact with the groove wall. That stuff is extremely hard to get off. You've literally got to soak that armature for 3 or 4 hours in alcohol and brush it off very, very gently. It really says something about the benefits that accrue from just taking a few seconds to keep that record clean each time before you play it. It's amazing the total life of a recording under that condition. It happens by just a coincidence that when that power amplifier is reading 100 peak watts, which is at plus 3 on the meter, you get 100 decibel sound pressure level at 4 feet in front of the bookshelf loudspeaker and 106 decibels at 4 feet in front of the 4 woofer system. I'll turn this up and then push it up all the way so you can hear what 106 decibels sounds like. (plays Lincoln Mayorga). That's the kind of thing the kids are subjecting themselves to in the rock groups and they're asking for 120 decibels, which is I believe right at the threshold of pain. We're finding now that what they're talking about is or experiencing is a hearing loss. They're now positioning the loudspeakers in front of the group rather than behind them as was previously the case. (Plays more Lincoln Mayorga). Well, that may not be good if you have a hangover. On these loudspeakers we have our neck stuck a way out. We have invited a lot of problems because the room acoustics now will greatly modify what you hear. For example: My own son happens to be a hi-fi salesman. He works in a store that has about the lousiest acoustics it's possible to imagine. They built the sound room. 3 sides of it were sheet glass as I recall it was 10 foot by 16 foot panels of glass 1/2 inch thick. That's 3 sides of the room. The other side was plaster. Well, at that point the sound wasn't too bad but they then lined, they covered the plaster wall with cork and they covered two of the glass walls half way up with cork. It happens that cork has a pretty violent absorption band about 8 or 9 decibels deep running from 500 cycles to approximately 5000. That was just exactly the same as taking this equalizer and (plays music) doing that to it. What were otherwise a pair of fine loudspeakers sounded like a juke box. What we had to do over in that room was not only go this far, but we had to add that in (turns equalizer controls) to get the thing back to something that was a normal distribution. You can see this is why really I like to emphasize the idea that you take a pair of these things home, to your home, because in the store here it's pretty easy to get some ideal conditions and really convince you this is the way to go. I would have to be less than honest if I didn't tell you that you really need to take these home because your home environment may totally louse up the sound. I just got back from visiting a customer who had a complaint down in New Orleans. This guy is a student down there. He's one of these kids that never gets through school I guess he's about 29 years old and he's still got 3 years to go to get his doctorate in whatever it is he's studying. It was some wild thing like Irish history or some damn thing. It was German history or something like that. That's his bag. But anyway, I walk into this guy's room. It is 10 feet wide, ok, 11 feet long and 12 feet high. There is no drapes no curtains, no nothing, just a small area rug, ok. You've gotta believe but with that much against you right away, practically just a cube, he has a ceramic fireplace, a big structure that's got to be 6 foot wide and 6 foot high--just glazed bright ceramic tile, ok and a loudspeaker on either side of that. Now, right across from that ceramic fireplace are two big glass windows that have got to be 7 feet high and 8 feet wide. God almighty! It was so bad that you could throw the phase switch from 0 to 180 degrees and you couldn't hear the difference. You couldn't get any stereo perspective. Now this guy has both those speakers towed in like this. He gets on the couch and he is complaining, oh yes, and the only record he's complaining about that he insists that he's got to be able to reproduce is Wagner's Ride of the Valkerie. He's complaining that the violins are a little edgy. You got to believe they're edgy! We had to pull the loudspeakers off this wall, put them on this wall, get a drape on this one. On top of that he had a cartridge that was really very brittle and get him into something this that could handle violin music decently. We finally cured the problem for him but this is typical of the sort of things you get into. People do absolutely crazy things. I got a guy in Houston who bought 4 of those 4 woofer things, stacked them 2 high, and he's got 4 2100's strapped for 200 watts each driving that whole thing. You just can't stay in the room with it. It's just out of control. That's the way he enjoys life and I guess less of a problem than chasing girls or running around getting drunk every night. It's at least harmless, I suppose. You do run into some real, real extravagant situations. Question: Are these direct coupled to your amplifiers? Well, I don't know what you mean. You mean are the amplifiers direct coupled all the way through? Yes. No, there's an autoformer in there which matches the impedance of the load for the optimum impedance, design center impedance, for the output transistors. There's a tremendous amount of misinformation, I think, out in the industry on this particular point from two points of view. There are some people who are running around saying that output transformers add distortion. Well, you can design a lousy output transformer and you can make a very good one. There's no problem with that. You can make that does add distortion and you can also make one that doesn't add any distortion. The significant thing: there are three significant advantages to having an output transformer; one is that you have a straight DC short at DC to ground across the output circuit so that you never get any 30 volt supply voltage to the voice coils of those speakers. If an output transistor fails, you have an instant piece of protection. Secondly, the design center impedance to give you maximum life out of that power amplifier is about 2-1/4 ohms that should be reflected back to the output transistors to give you optimum voltage and current excursion to hold the junction at the lowest temperature. There's no way that you can do that unless you use a transformer. So this way you can get full power at 4, 8 and 16 ohm loads with optimum conditions applied to the transistor. If you're a company that undertakes to bring its equipment back to original specifications regardless of age at no cost to the customer, believe me you don't mess around with things like this because all you need is a bomb that you have to eat a lot of and it'll sink you financially. While a lot of other people run around with poetic license and decry the presence of the output transformer, we look at it from the practical point of view of making sure that our customers are not plagued with frequent breakdowns 5, 6, 7 years from now. Because the way we operate we would have to absorb the cost of that thing. The other point is that people claim the output transformer reduces the damping factor and it does. It reduces it from 100 to 40 on the 4-ohm tap and to about 15 on the 16-ohm tap But that has absolutely no significance on the performance of the loudspeaker. George Augspurger of the JBL Company years ago wrote an article that appeared I think it was in Electronics World. In fact it was in 1967 I believe. He showed that for a damping factor variation from 16 to 640 the net damping change to the loudspeaker was only from 1.23 to 1.33. Now the reason for that and the thing that is really discouraging when so many people write in an irresponsible way is that the DC resistance of the voice coil is always in series with the loudspeaker. An 8-ohm loudspeaker has always got something in the order of 7 or more ohms in series with it. The damping factor is simply the reciprocal expression for the generator resistance coming out of the amplifier. By the time you add the voice coil resistance, the resistance of the toroid (coil) in the dividing network, the lead resistance, you've got always not less than 8 to 8-1/2 ohms in series with an 8 ohm loudspeaker. What difference it makes whether the generator resistance is 1/100th of an ohm or 1/10th of an ohm, you see, is mathematically and practically of no importance at all as far as the transient response of a speaker is concerned. As a matter of fact, I think I have a set of curves showing the change in tone burst pattern for damping factors going from 100 down to 1. Until you get below 10 and get very close to one there isn't any significant change. After a break Gordon answered a few more questions. First of all not only are we not afraid to put specifications on paper but we're the only company that will give you a money back guarantee on the specifications. If that machine will not meet it's published specifications and cannot be made to meet it, we will refund you your total purchase price. We don't mind putting specifications on paper. What the switch on the back of that is for (on the MC2105) is that there are some nuts running around the business who think that unless a power amplifier can pass a square wave it's not suitable to drive a loudspeaker. What they're extrapolating from is the idea of using a square wave for testing an amplifier to the idea that music has square waves in it. The last thing in the world you want that power amplifier to do is to go all the way to DC flat because what will happen there is you will knock the hell out of those cones. There's no air loading on those mothers, on those cones, (laughter) below about 20 cycles. If you have any rumble coming out of that turntable and you got a flat response down to DC, you're going to use up all that useful excursion of that cone just to accommodate that stupid rumble. You got to put a direct position on there so the nut who's hooked on the square wave thing can see the square wave. You want to put the other position on in the system, which simply rolls the response off below 20 cycles. People are out of their trees. There was a guy named Stuart something, I forget his last name, he broke into the idea that an amplifier had to be flat to 100 kilocycles. He was trying to seriously convince people that there were music components at 40 kilocycles. Unless you amplifier had a rise time of 1/10th of a microsecond and a flat response to 100 kilocycles, it wasn't worthy of being plugged into a system. He must have never looked at a frequency response graph or portrayal of power in a sound wave. The RMS power in an ordinary orchestra distribution at 10kc is down in the order of about 15 decibels from the loudness at 500 cycles. That's what you see with a real time analyzer that's giving you the RMS output. If you convert the thing from RMS to short interval peak, now you'll see a reasonably flat distribution. Above 15 or16,000 cycles it starts to go off very quickly. I want to thank you very much for dropping by. Thank you! You're very welcome. More text and pictures about McIntosh will be added as my research continues. Any comments, corrections, or additions are welcome.